Update 12/1/01: The Gunfight Label Contest is now over! Congratulations go out to David Exton, whose label was selected by Gunfight's author Manuel Polik as the winning entry!! David will receive the first production Gunfight cartridge with his label, along with a special package being created by Manuel Polik. In addition, Manuel has announced that everyone who created a label will be able to buy a copy of Gunfight from Hozer Video Games affixed with the label they created! The response to this contest was overwhelming and the quality of the labels submitted outstanding. We don't envy Manuel for having to choose a winner among them! Kudos go out to everyone who submitted an entry for this contest! 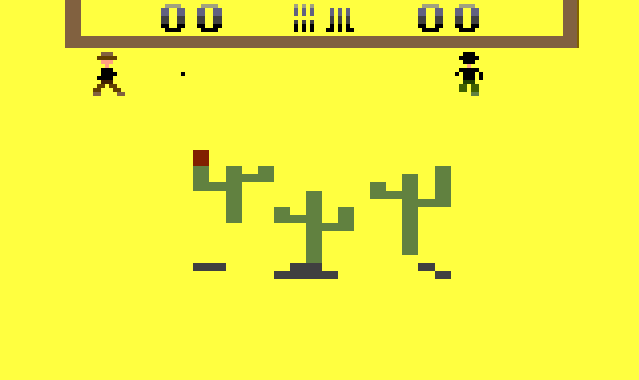 Gunfight is a new Atari 2600 game recently completed by Manuel Polik. AtariAge is sponsoring a contest to provide a label for Gunfight. This label will be used on the cartridges produced by Hozer Video Games. The winner of the contest will receive the first cartridge produced by Hozer, using the winning label! The Gunfight manual will also be included. "It's shoot-out time and you've got to be faster than your opponent or the computer. Move, dodge, or hide behind a covered wagon or cactus. But whatever you do, don't waste your time because your opponent is shooting back. Take your position, aim, and fire before he gets you..."
Escape Scenario: The left player wins when scoring _once_! The right player wins when surviving 99 time units. You can download the PAL and NTSC binaries for Gunfight here. Gunfight is known to run fine in the z26, Stella, and PCAE Atari 2600 emulators. Please visit the official Gunfight Home Page for more information. © 2001 + 'XYPE' logo. 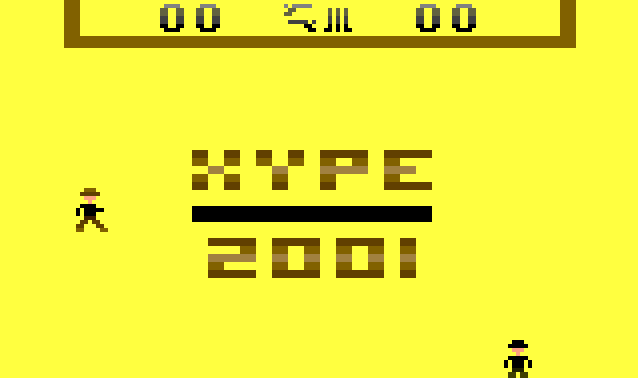 XYPE is Epyx backwards and you are encouraged to use a style similar to Epyx's logo. Release # 01. This is XYPE's first release, future releases will be numbered sequentially with a two digit model number. 'Gunfight' Logo. A western font for this is the obvious choice. Artwork. In the words of Manuel Polik, "I want to have something more dark & sinister on the cover. Clint Eastwood instead of John Wayne." Hozer stuff. Since Gunfight is being sold by Hozer Video Games, it additionally requires a Hozer logo on it, as well as the text, "Cartridge made by Hozer Video Games". Here are some examples of some labels created for Hozer: Example 1, Example 2, Example 3. You can download this image from the Hozer Video Games site, it's a reasonably large version of the Hozer logo. Labels should be saved in a non-lossy image format such as TIFF, PCX, BMP, or PNG. If you need to save your image using JPEG for some reason, please use a minimal amount of compression. In order for the label to look good when printed, it should be saved at at 200dpi or better. If you are concerned about large file sizes you can drop us a line before mailing the file, but generally anything under 10MB will not be a problem. Label submissions and questions about the contest must be sent to editor@atariage.com. We will post submissions publically on this page as we receive them. The contest may also be discussed in our 2600 message board here. The contest ends on at Midnight, November 28, 2001 (GMT +1:00). All submissions must be received by this time! A winning entry will be chosen quickly by Manuel Polik after the deadline expires. The results of the contest will be posted on AtariAge.